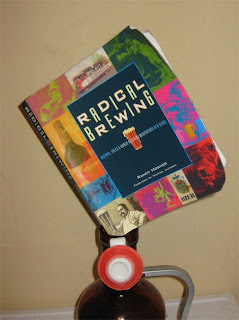 Randy Mosher's Radical Brewing is the sort of homebrewing book that I wish I could write. While it does include some basic instructions for the new brewer the main focus is on things that fall outside the realm of "traditional" brewing. Topics covered include using raw grains, sugars, fruit, herbs, spices, liquors, as well as interesting technique, recipes, and history. It is the perfect book to flip through for inspiration when you feel like you haven't brewed anything really interesting in awhile, but it is not the sort of book that I would recommend to someone who has just started brewing beer at home. Content: The first few chapters of the book contain a basic look at the malt and hops, and how to brew and taste beer. If this was your first book you would probably be able to make a decent beer, but a book aimed at beginning brewers will contain more basic information that would prove helpful. The rest of the chapters each take an element of beers/brewing and run with it, with the recipes in each chapter giving an example of how to use the ingredient/technique discussed. The first of these is an attempt to cover some of the most basic styles (blondes, stouts, brown ales etc...). That said even these most basic recipes are probably complex than any recipe in How to Brew, how can you not love a book that includes a 1.085 Brett spiked IPA as a "Basic Drinker"? Some chapters look at a technique. Lagers get a chapter covering how they differ from ales (including how to do a traditional decoction mash), but most of the book is primarily about ales. The chapter on brewing big beers is a good read for anyone who wants to do strong beers of any sort. Mosher covers the basics like correcting hopping rates to deal with the high gravity, pitching lots of yeast, and waiting plenty of time, but also looks at old mashing techniques like the parti-gyle and doble-doble for achieving a high OG without a 4 hour boil. Other chapters look at groups of beer styles. For example there are a couple that look at different Belgian beer styles (variations on wits are given almost an entire chapter). There are also chapters on beers that bend style guidelines (gratzer, pilsener wine, and Black Ship Pirate Stout), and historical beers (including gruit, kvass, colonial ale, and kotbusser). Many of the weirder foreign/historical styles are given both in an authentic form and a "cheaters" version which is easier to pull off (and probably more to the average homebrewer's palette). Other chapters look at a class of ingredients. Grains besides barley (including oddballs like wild rice, kamut, and millet), herbs/spices (including basil, cubeb pepper, and sassafras) and honey (with recipes for honey beers, and meads). It is hard to say more about these chapters as there isn't an underlying theme or topic, just a shotgun blast of possibilities. The suggestions I have used have worked out well for the most part, but often there are no firm recommendations for how/when to use many of the ingredients. The book finishes up with some odds and ends like things to do with a group of brewers, pairing beer and food, brewery building, and growing/processing your own ingredients. This is a great place to look when you feel like you are in a rut with the hobby. Accuracy: The actual content of the book is terrific and accurate as far as I can tell, but the editing is the biggest weak point Radical Brewing. The numbers in particular are just off all over the place. Mainly this takes the form of bad metric/standard/percentage conversions in the recipes (how hard could that have been to double check?). The estimated ABV also seems to be lower than it should be for most recipes given the OG. This caused me a serious problem on a wit a few years back. I made the Wit Guy White Ale exactly to spec, hitting just .002 above the suggested OG of 1.052. After 14 days of fermentation the beer was down to 1.019, that seemed a bit high, but it had held stable for 5 days and was at 4.6% ABV (well above the recipe spec of 3.6-4.2% ABV) so I decided to bottle it. Needless to say WLP400 is well known for stuck fermentations and I ended up with 2 cases of massively overcarbonated beer (it ended up down to 1.013). This is the sort of minor editing mistake that can cause major issues for the new brewer. The author does maintain a list of errata that you can reference any time you want to make a recipe (not that the ABV issue is even mentioned), but this is a pain to check if you are just flipping through the book. Recipes: Nearly 130 recipes in total. Most of them have all of the details spelled out, but some of them are just variants of other recipes in the book, for example the Schwarzbock recipe is just a paragraph suggesting adding more carafa, base malt, and hops to the Schwarzbier recipe on the previous page. The recipes and variants cover just about every conceivable type of beer from bitters, to lambics, historical beers, and style crushing creations like a chanterelle beer. Any time I feel like I want to brew something fun I'll flip through Radical Brewing until a recipe catches my eye. Basically all of the recipes are all-grain, but most have a mini-mash or extract plus steeped grain option as well. One thing that might bother some people is that the author never gives a specific yeast strain suggestion. Most beers call for a country of origin, such as Belgian or English. Readability: It is the perfect book for skimming. loads of charts, recipes, drawings, graphs, and text boxes. It is also not a very technical book so the reading is a it more enjoyable than How to Brew or Designing Great Beers. The text is well written and brimming with excitement, far better editing than the recipes received. That said because of the huge variety of topics the organization can be pretty confusing. For example sugars are covered in the Bent Beers chapter, but a Belgian , Big Beers, or Historical chapter would have all been equally valid places to put it. I think trying to get all of these topics neatly organized into logical chapters was an impossible task from the start. Overall: This was a harder book to review than any of the others I have done so far because it covers such a huge range of topics and doesn't have any major take away points. After one or two "normal" batches of beer many new brewers seem to get the urge to brew something really out there. This often results in terrible beer. This would be a perfect book to pick up if you have a crazy idea that you want to refine into something that might actually be drinkable when you are done. It is One of the most inspiring books I have, and a good replacement for the Complete Joy of Home Brewing fan who feels that the other books on their shelf don't have too many formulas and not enough fun. I love this book! It has helped refine some of my recipes, but I am disappointed on their editing efforts. Agreed, hopefully there will be a second edition at some point that fixes the editing issues. Looks like it will be either Farmhouse Ales or Principles of Brewing Science next week. In a couple days the poll for book reviews ends the order will be locked in, so get your last minute votes in now. Yeah, this is how a how-to-brew book should be--entertaining and informative. I've had success with the recipes. I use the book for reference to see what different spices could add when I'm so inclided. Also, no other brewing book do I pick up when I just feel like reading a little about beer. Each chapter is self-contained and easy to tackle, even if some of the techniques aren't. Though, honestly, Mosher does a great job taking difficult concepts and techniques and simplifying them. Reading Radical Brewing really inspires pushing traditional brewing without getting too crazy or off from important brewing basics. Mike, I agree with your take on this book. Radical Brewing periodically finds itself spending time on the back of my toilet. It's an entertaining read even if I'm not looking for any specific recipe inspiration. I like Mosher's approach here. Ha, this book is in my bathroom as well, and favorite all-around brewing book to spend five minutes with. It's not as rewarding to read all the way through, but great if I just want inspiration about a particular style or ingredient. Definitely worth owning. as you know im a big fan of this one as well. your dead on when you say its a replacement for Joy of Homebrewing. Its definitely meant for the young crop of adhd afflicted homebrewers.